The Vice President cannot risk completely disengaging from government. Her access to the President and Cabinet members can advance her pro-poor agenda. That was why, despite starting with a low awareness rating when she joined the vice presidential race, she won. And that is also why, her handlers are now perplexed why, in a span of one year, she had become much-hated by netizens, her approval rating declining. Despite the very limited mandate and funds of Office of the Vice President, Robredo launched the Angat Buhay program, which seeks to match resources from the private sector with needy communities. Eight months since its launch, the program has given boats to fishermen in Maribojoc, Bohol; built classrooms for schoolchildren in Hinoba-an, Negros Occidental; and sent cash grant to the women weavers in Marawi City, among others. The program is now servicing up to 127 cities and municipalities with the help of over 300 partners. Robredo would often talk about her laylayan visits to far-flung and poverty-stricken areas in speeches and how, in many instances, Filipinos there are surprised to see a national official for the first time, says his chief of staff, Undersecretary Philip Dy. “During the laylayan visits, there is very, very warm reception. It’s a stark contrast with all the hate being thrown at her online. Every time she goes anywhere, even one instance of a negative reception never happened to her,” said former Akbayan Representative Barry Gutierrez, Robredo’s legal adviser. WARM HUG. Vice President Leni Robredo holds a dialogue with bamboo stick makers in Purok 4, Sitio Ibaba, Brgy. Pinagbayanan, Taysan, Batangas last June 13, 2017. Taysan, Batangas. Photo from the Office of the Vice President. Robredo’s first year in office came with relentless attacks on her mandate and influence. In sum, she was painted as a “puppet” of the Liberal Party. 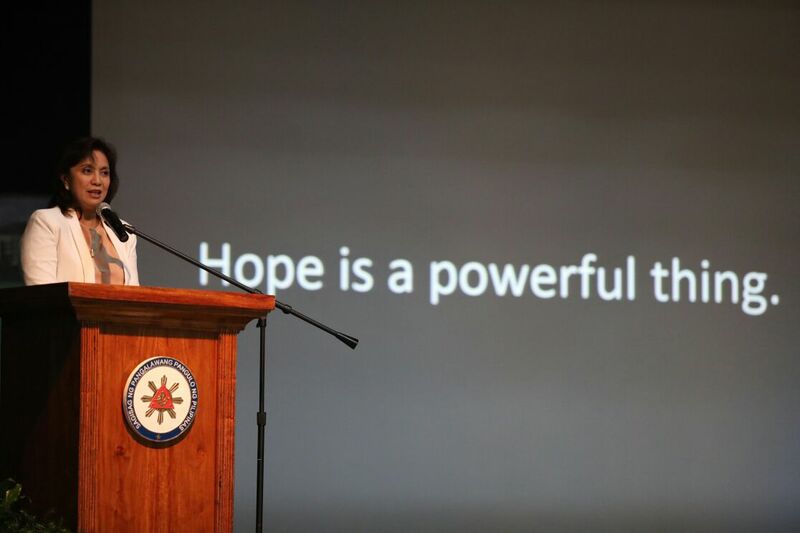 Harvey Keh, Robredo’s co-founder of the Jesse M. Robredo Foundation, said it was a concern her supporters echoed, especially during the height of her video on the drug war played at a United Nations event. He and other sources said the Vice President’s decisions and statements were devoid of “dilawan” influence. She listens to inputs of advisers, but ultimately decides on her own. “None. It’s only recently that they (LP members) have been meeting more regularly because of the [impeachment] crisis. But in what I would say 9 months of the one year, they barely even made contact,” said a source who is part of Robredo’s close circles. Her association with the party is her weakness, says political analyst Carmel Abao of the Ateneo de Manila University. Robredo, she says, has to go back to her narrative during the elections – an independent woman inside an old political party of veteran politicians. DILAWAN. Leni Robredo puts her arms around the shoulder of one of the Sumilao farmers during their send-off on May 6, 2016. According to surveys, positive public perception of Robredo is gradually crumbling, the obvious drivers being her link to LP and attacks on social media. In the latest Social Weather Stations survey released in April, Robredo’s net satisfaction rating was at +26, from the +37 she got last December. Her trust rating in the SWS survery released in May also went down to +30, from December’s +46. “I think anyone that the President attacks gets affected because [of] his huge popularity at the moment,” Pulse Asia executive director Ana Tabunda explained in a Rappler Talk interview on April 27. “Ratings of our leader normally suffer due to political issues. Those slides you can see in our data, they are not necessarily due to economic [issues], they are due to political issues,” Tabunda said. Robredo has registered her dissent on several big issues that surfaced in the current administration: extrajudicial killings brought on by the drug war, reviving the death penalty, women’s rights, foreign relations, martial law, and Marcos’ state burial. Yet, while opposing these policies, Robredo also repeatedly said she was supportive of the President. Abao says the Vice President should make her stance on national policies clearer, for leadership to transcend. She may have expertise in good governance, transparency, and the concerns of the poor, but her take on pressing issues like contractualization, foreign policy, peace talks, and the Bangsamoro Basic Law is not sharp enough. “She talks about these things, but you don’t see what her stand is,” Abao said. “Eventually they will go to those who think she’s not doing anything, she’s useless, she’s insiginificant, she’s irrelevant, and that is the worst form of political death,” the source said. It is not a question of weakness, her advisers say. After losing a husband, raising 3 daughters alone, slaying a dynasty for a congressional seat, and emerging victorious from the wild, wild, west of a national election, it is hard to argue that she is not strong. It's a question of who is the opposition she should lead? “She hasn’t embraced being opposition because there is no opposition. Who? She alone?” asked a source. Insiders say a certain base of Robredo’s supporters, frustrated with the current administration, want her to go full-on opposition. But Gutierrez explained that the Vice President cannot fully take this role at the risk of completely disengaging from the government. She has to further her agenda of inclusivity. “She’s in a position to actually have access to members of the Cabinet, to the President. And her attitude is: as long as I have that access, as long as I still have that opportunity, isn’t it incumbent upon me to actually maximize that platform?” Gutierrez said. Given the history of the challenges her office faced, it’s hard to blame her for taking a safer stance on issues. She herself knows she has to conserve her political capital, sources said. The Vice President was expecting a quiet, smooth-sailing 6-year term, where she would simply support the Duterte administration. She could focus on her advocacies, her job as the Vice President, and the Angat Buhay program. But the way the year 2016 went – the viciousness in the political arena since the last elections has not relented – it seems things will just get noisier. People around Robredo believe she will be able to rise up to the challenge. Her mission, her promises to the public will keep her going. “I think she has evolved to be a person who has a very strong character and a belief. A woman with a mission, a woman of courage. A mission to really try her very best to do her country [good], to change history,” Keh said. Her advisers say people still don’t know Robredo well enough. They have a lot to discover.